Although much has been written about the best time of year to travel in Africa, most countries are a year-round destination - depending upon your interests. For many travellers to this vast and diverse continent, wildlife is the major attraction. One should always remember that the so-called 'peak season' is just that, and accommodation establishments tend to be booked well in advance. Many Safaris Lodges are small, and therefore space is at a premium. If you want to experience the majesty of the great migration in East Africa, it is advisable to book well in advance, likewise, if your interests are travelling to Cape Town, and the Winelands in December. It is important to understand how seasonal trends might affect your trip. Remember, however, that weather is variable and so it is quite possible to go for days without rain during the rainy season, or have thundershowers in the middle of the dry season! The grass can be long in some areas after the rains; therefore, game viewing at these times can be difficult. In some areas, the wildlife will disperse during the rains due to the ample water supply, as they are not dependent on water holes. The best game-viewing period in Africa is generally during the dry season. Permanent water supplies attract animals, the vegetation becomes thinned out, and trees don't have so many leaves to obstruct the view. This optimum safari season usually includes winter (May-August) and the hot spring months of September and October. The climate is comfortable in the dry winter months of May, June, July and August. Daytime temperatures are mild and the nights get a little cool. East Africa - Kenya, Tanzania, Uganda. There are two rainy seasons in East Africa, the first, known as the long rains is from April to June and the shorter season from late November through to December. Many properties in the game viewing areas do close during April and May, mainly due to bad road conditions. The islands of Zanzibar are also affected during this period. 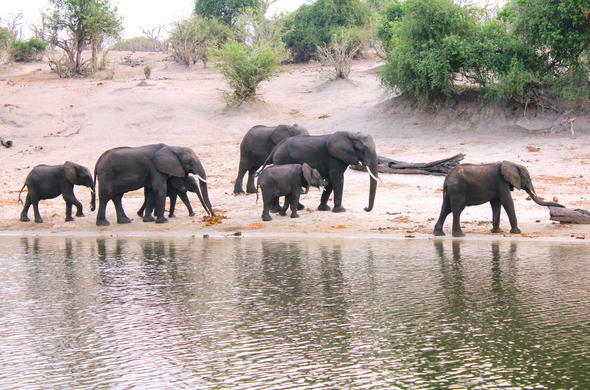 The dry seasons are generally better for game viewing, as game concentrates around the water sources. The weather patterns play a major role in the great migration, as the animals follow the new grasses, which are dependent upon the rainfall. In most parts of Southern Africa, the rainy season is generally from November to March. This is particularly true for the safari areas. The peak safari time is in the dry winter months as this is when the game concentrates around the water sources, although the summer months can be productive - especially for keen birders, as the migratory species breed during this period, and the Okavango Delta, for example, becomes a paradise. Zambia tends to be more seasonal, as certain areas (Lower Zambezi and South Luangwa) can be made impassable due to bad road conditions. Certain properties do close between November and April. The Western Cape area, including Cape Town, tends to experiences a winter rainfall, making the peak season to travel the summer months. The weather patterns of the islands are similar to that of Southern Africa with summer rainfall, November to March. The ideal time to visit is from May through to October. Madagascar and parts of Mozambique can be affected by extremely inclement weather including massive flooding and cyclones in February and March. The remote locations of many safari camps means they are reachable only by light air-craft. Luggage weight restrictions apply.